We’ve all got it, that bottle of rubbing alcohol in the medicine cabinet. Even the most inventive DIY types probably have a mere handful of uses for that bottle, be it rubbing on sore muscles or maybe treating a few odors around the house. Recently, however, I recently came across a full 35 ways to put that bottle to work around your home! The following rubbing alcohol uses will for sure make you think twice about skipping past the bottles of rubbing alcohol the next time you are at the grocery store. 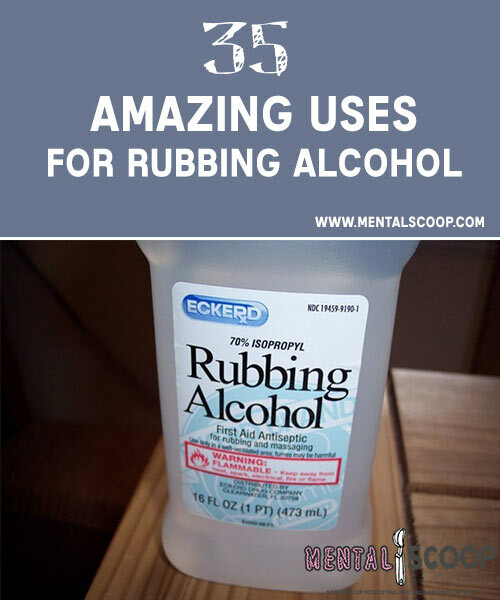 Rubbing alcohol is also known as isopropyl alcohol. You can spray it, rub it, dab it and remove stuff with it. 1. Mosquito Bites – to relieve itching, disinfect, and promote healing, simply dab on a little rubbing alcohol. 2. Ticks – to make ticks loosen their grip, dab an attached tick with rubbing alcohol. Remove with tweezers as close to the skin as possible, then follow up again with alcohol. 3. Cold Sores – to promote healing, just dab alcohol on the sore. 4. Muscles – rub on sore muscles to relieve pain. 5. Joints – yes, it works on painful joints as well! 6. Ear Wax Removal – mix alcohol and vinegar equally and dab into ear. Treat every 2 weeks. 7. Sterilizer – use alcohol to sterilize items such as thermometers and tweezers. 8. Nail Fungus – mix equal parts alcohol and water and use as a simple and effective foot soak. 9. Swimmer’s Ear – by simply putting a few drops into the affected ear, the alcohol will help dry out the ear and prevent infections. 10. Athlete’s Feet – Treat and prevent this rash with a daily rub of alcohol. 11. Electronics – dampen a rag and simply wipe your home electronics clean. 12. Hand Cleaner – rubbing alcohol is great for quickly killing germs and odors on hands. 13. Hand Gel – To make a quick and effective hand sanitizer gel, just combine 3 parts of rubbing alcohol with 1 part aloe vera gel. 14. Homemade Window Cleaner – combine 3 1/2 cups water, 1/4 cup rubbing alcohol, 2 tablespoons ammonia, and a few drops of dish soap. 15. Hairspray – to remove spray buildup from mirrors and countertops, spray the area with alcohol and wipe clean. 16. Windshield – to remove frost, fill a spray bottle with alcohol and just spray it on. 17. Paint & Ink Stains – soak spots with alcohol for a few minutes then wash. It also removes pet urine stains. Soak up as much as possible with paper towels. Pour alcohol onto the wet area and let soak for 10 minutes to kill the bacteria and odor. Soak up the remaining alcohol with more paper towels. It does not damage carpet or hard flooring.